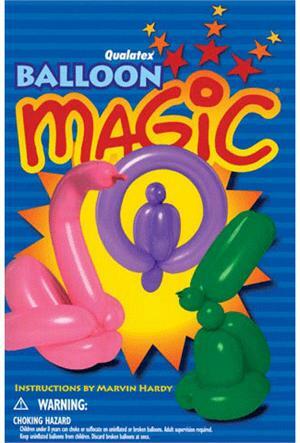 In this Balloon Magic book, you'll learn the secrets of balloon twisting, a fascinating art form that children of all ages will enjoy! With these step-by-step instructions and a little practice, you'll soon be able to make fun, colorful creations with Qualatex balloons. Balloon figures are perfect as: party favors, decorations, storytelling props, teaching aids and more! You will learn basic inflating skills, different kinds of twists, and tying basics. Then you will learn how to make: a cat, a mouse, a giraffe, a bunny rabbit, a bassett hound, a dachschund, a chihuahua, a poodle, a squirrel, antlers, deer, moose, tulips, a daisy, a fish, a lamb, an elephant, parrot in a swing, a swan and a bi-plane.